This history was compiled by Pure Knights, Elementofice and Demonchild27 prior to being deleted. The early history by Pure Knights/Ele was later edited by Demonchild to sound more coherent. Unfortunately when deleted parts of the early history were lost (maybe 2 sections at most) however were minimal. There were other contributors but the foreword of the old history was lost and I cant exactly remember who did what. It is a long history and a lot of effort was put into writing it, so enjoy. Corruption was born when mutual friends Pure Knights, Mortamus, Clever Ninja and Sekalodnal saw an opportunity to create a clan that met all their needs. All had led clans in the past and had considerable success, so naturally the idea was united, they could make something special. The beginning of Corruption was very unique, the first war was arrange to be the Corruption leadership against a new clan lead by Viper### – the Leviathan Horde. On the day 3 Corruption leaders went head to head against the “entire Levianthan Horde”. It turned out to be a mere 7 guys, 1 or 2 of which we were too high of a level to attack. They were crushed, and after asked for a rematch in a few months, we agreed, and moved on with our business. From this point members starting flowing into the clan including leaders old friends made during earlier stages of clan life creating a dynamic and experienced member base from the start. Like most clans, there is need for a common enemy. In Corruption’s case, the first was the Rune Raiders. The first of Corruption’s wars against the Rune Raiders, took place alongside their good friends, and allies the Dark Raiders. As Corruption and their allies met against RR and their allies, they were filled with amusement to find the enemy in full Mithril, which was ironically the Rune Raiders clan armour. Wasting no time once more, Corruption slaughtered their enemy within minutes. The most interesting part to this war was the location at which it was fought, The Bandit Camp. The war was to be decided when one side had clear control over the Bandit camp. After establishing control of the Camp, and sending RR members sending south, a strong defense was put up at the entrance to the Camp, which oddly enough worked. The war lasted a mere 20 minutes, which was short for Rs Class wars, with over 90% of RR members dead, and 0% of Corruption/Dark Raiders dead. Thus, the famous quote of “Alright, I think this sht is over” was said by pure knights, as the battle drew to an end. LH, embarrassed from their first defeat, decided to give Corruption their promised rematch, and then declared war on Corruption in an attempt to even the score. However, they did not know that they would shortly suffer a greater loss, leading to the subsequent fall of their clan. The war was again to take place at the level 38 Altar, as most wars of Runescape Classic were fought. 40 Corruption and 10 LH met at the battlefield, and within 5 minutes LH had been defeated; and was eliminated from the clan world. The AoD was an old Alliance of clans. Pure Knights, being a former leader of the AoD decided to restart the alliance alongside Pure Rune, and Court of Dragons. Pure Rune and Corruption had been close allies for a long time, and when CoD was reformed with X Dragon X at the helm once again, another former AoD leader was back. The goal of this AoD however, unlike the original was not to defeat the Syndicate (now known as The Alliance, well basically the same thing anyway) but instead to dominate the upper-mid level clan area. However, trouble was soon on the rise. Pure Rune and Corruption were to have a fun war in black, when CoD members crashed the war. After this, both Corruption and Pure Rune dropped CoD as allies, and AoD on hiatus until further notice (this hiatus remained until the closure of PR). This portion of Corruption’s history has little relevance to the clan world as a whole, but it played an important part in the life of the Corruption. Rs Democracy, a clan that was seen to have much potential after a victory over Corruption’s allies Pure Rune, soon suffered a great defeat to the Wild Dawgs. 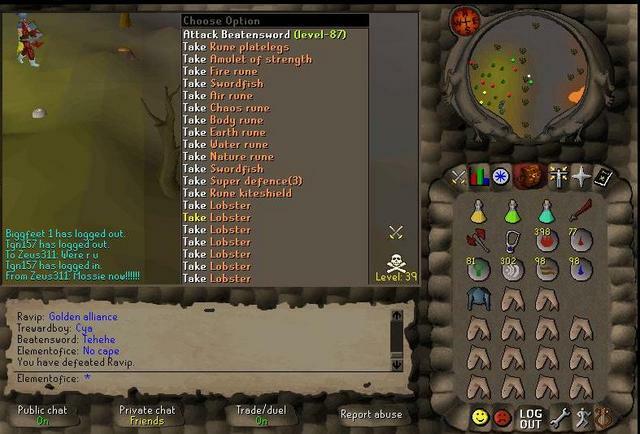 Twice beaten in battle by the WD, a great inactiveness swept RS Demo, and in result was disbanned. As the RS Demo members searched for a new clan(s) they were somehow naturally drawn to Corruption, bringing in a large share of RS Demo members, most of which have played a pretty large role in the clan’s life. After much success, Corruption wondered of what was in store for the future. They did not know that one of the greatest wars of RS was to take place and that them and their closest allies Lords of Chaos, Zeonic Force, Pure Rune, and the Dark Raiders were to assist Dias42 (a former RR member who left due to the disagreement in which the direction of the clan was going) against the Rune Raiders, Chaos Angels, EPK, KoD, and many others. The battle lingered on for about an hour and a half, but the true winner was clear within the first 15 minutes. This was the 4th or 5th largest war on Runescape Classic, but it did however not last long. Once again, after a short period of time (approx. 15 minutes) the victor was clear — Corruption and its allies were on top yet again. 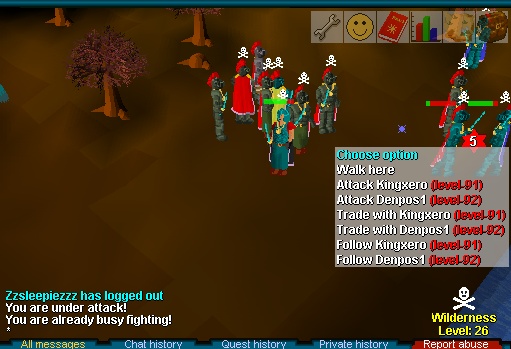 After many of the enemies members had ran, or logged (including the RR leader, FireyKnight), war crashers (which was a big phase back in RSC) showed. These crashers played no part in the actual decision, but did however make the war linger to a time of almost 2 hours. At this point, Corruption being at its RS Classic prime and having a higher moral than ever, was devastated that their beloved leader Visual Pain was stepping down. In his place Vox0m, at the time being level 90, was appointed as leader of Corruption, alongside Pure Knights, and Clever Ninja. Not long after Vox0m was appointed to leader, problems arose. Clever Ninja was busy with school, and had very little time for Runescape. Pure Knights’ monitor for his computer broke, and left Vox0m in charge, alone. As Vox0m’s first act as leader of Corruption, he searched for a clan to war. After long thought, Vox0m made his decision on warring TRWF (The Runescape War Hungers Federation). The war was agreed upon both sides to be a fun friendly war in rune between the two sides. However Vox0m’s temper grew as he found out that Denpos1 and BoB Cob (our ally, leader of Pure Rune) was mocking his leadership capability. As a result a huge flame war erupted between TRWF and Corruption, ending the notion of a “friendly war”. Pure Rune was thus dropped as an ally. Unknowingly to the rest of Corruption, a member of Corruption by the name of K O Pker crashed a fun war held by the Gladiatorz. Furious, the Gladiatorz planned to crash the war between TRWF and Corruption. Rumors of Vox0m inviting ZF spread between many clans in RS. As the battle day came, the war ready Corruption was awaiting the enemy when an unexpected visitor, ‘The’ clan appeared. THE clan remained neutral and did not attack any of the Corruption members…at the start at least. The enemy emerged and the battle raged on, both sides receiving few casualties. Suddenly, the Gladiatorz appeared and joined in on the Corruption bashing. Some THE members soon followed the lead set by Gladz. Zf was rushed into the war to destroy the Gladz troops. In the end, the war was called to a draw, due to the crashing by THE/Gladz. As the time of Runescape Classic drew closer and closer to its end, the clans of the game were faced with a new decision on which game to play. Corruption, like most other prominent Rs clans decided that they were to become a Runescape “2” clan. Soon after the mini war and the rise of the new Runescape, Vox0m grew weary of the responsibilities in leading a clan, and appointed Zeus311, an ambitious level 97 at the time to take his place. Zeus would soon become the most controversial leader in Corruption’s history amongst its own members. As Corruption grew, and more members poured in, Corruption seemed to be heading toward success. One day during a pk trip, we ran into the middle of a mini war between Exercitum and the Gladz. Not knowing for sure their status towards Exer, Corruption assisted them against their rs1 nemesis gladz. Together Corruption and Exer drove the Gladz out of the wild, and a new alliance was formed; the Exercitum of Corruption. Together the EoC took their share of the P2P wild, defeating clans in p2p mini wars such as Rsd, and occasionally DI. Soon after, two new clans Mystic Dynasty (led by Raimus, and X Dragon X) and Anarchy joined the EoC. After MD and Anarchy joined the EoC, the name was quickly changed to the Golden Alliance. The aim of the alliance had also changed; the goal now was to defeat The Alliance. And that is just what they set out to do. In just one week the GA dominated The alliance on all their pk trips. The GA’s new dominance of the Wilderness was something special. Random players were wearing yellow capes (GA’s cape colour) out of fear of being attacked. However, this alongside the fact that the GA was made of pure PKing clans brought about internal warfare. Within a short while, the Golden Alliance was to fall. After Runescape Dinasty, and Damage Inc. had considered teaming together (they were mortal enemys) to fight the GA, much tension grew. MD wanted to pull out due to the accusation of them “always relying on their allies”. A decision was made to have MD fake to pull out of the GA, but still support them in times of need. However, MD imploded upon itself, and at a pk trip we decided to attack Anarchy (as we were never on good terms with them). Once again, it was Exer and Corruption who remained allied. After a strong and close bond, ZF and Corruption found themselves slowly drifting apart as they had no more allied wars with one another, or fun wars between each other. After several mistaken conflicts in the wild between the two clans, including one of which were the ZF leaders massacred at the hands of Corruption members, ZF dropped Corruption as an ally. War was soon declared on Corruption. Prior to the war, a six versus six mini war between Corruption and Zeonic Force was to be called, but Zf brought 20 who quickly dismantled the 6 Corruption. Thus Zeus311 informed Lord Death of Zf that it was to be an allied war. As the war date in early summer of 2004 drew near, the rumour of The Alliance (whom Zf were now friends with) possibly crashing the war came to be. In response, on the war date Zeus311 decided to ask Supa Vegeta (leader of Exer) to bring his members along to the war. On the way to the Greater Demons (the war spot) Corruption/Exer came across a group of Alliance members, of whom were quickly slaughtered. After a server switch at the Spider Hill, Corruption and Exer moved in on ZF, expecting a massive number of ZF/Alliance members. To our surprise, it was just ZF, whom Exer/Corruption quickly dismantled. Although technically losing to default, we got a good laugh from soundly defeating ZF. Few weeks later, X D X and his members have either all left or been kicked from Corruption, but the damage was too much. As if this wasn’t enough, Corruption member Crazy Foo997 proposed the problems blaming Zeus311 in a post and therefore got kicked. Robtokill decided to join his friend and also got kicked. A week later P ko and 1hellfire1 decided to follow Crazy and also left. Zeus311 was training, Pure Knights (co-leader) was inactive, and all members with low morale. Pure Knights eventually came back, and his real life friend Chopa234’s clan disbanded so their members joined Corruption. Deathrune666 also joined Corr. But this time we didn’t have the same problems as with MD, although there were problems. Members like Runefox010, Greenfox101, and Easyez1975 joined. The former enemies of Corruption, the Elite Power Knights (EPK) had since disbanded, and reformed as the Legendary Knights. A feud between Corr and LK broke out, and a war was about to happen, but LK disbanded once again which caused the war to be cancelled. Thus, a war against Jagz was to happen one week after the Saturday the LK war was to be on. But, because only five days notice was given, not many Corr showed up on war day. Zeus311 himself was late to the war but eventually showed up. The war was won by Jagz due to Corr’s poor turnout. Within 20 seconds, Pure Knights was dead, and seconds after that many others including XhitpointzX (23 seconds) were sent to Lumbridge as well. Though Corruption lost the war, much respect was gained for fighting a fair 1 on 1 war. Many members blamed Zeus311 for this loss. Few days later, Deathrune666 went inactive saying he was disgusted as to how Corr faired against Jagz in the war. Pure Knights went inactive again. Since Zeus311 was leading alone, Deathrune666 told Zeus311 of the problems thus causing Zeus311 to promote Deathrune666 to co-leader. Elementofice was also promoted to High Council. Members like Greenfox010 and Runefox010 ranted on how Deathrune666 only came back because he was going to get leader position. But their claims were false. At this point, members of the high council were B O O M, Deathrune666, Elementofrice, Pure_Ice89, and Bountykilla1. Im_Dabest03, Shortd00d03, Stiffler5 and 0mca joined Corruption. Runewidow also joined Corruption. Corruption and Exer still remained allied after the fall of the original Golden Alliance. However, after being outnumbered in mini war after mini war, Corruption and Exer decided to call for help. Upbrother, the leader of LK was always begging Pure Knights for an alliance between his clan and Corruption. Seeing the opportunity to pick up extra bodies for mini wars, the Golden Alliance allowed LK to join. After Exer members, alongside a few Corruption members crashed an Alliance fun war. The Alliance was . They decided to call war on the GA. Since the GA had 3 clans, and The Alliance had 4 (alongside TMRD, who were close allies and involved in the crashed war), it was 5 on 3. The Alliance, sticking to their “we’re not taking away 2 clans” act forced the GA to look for allies. Damage Inc, Anarchy, and The Dark Legends (former allies of Corruption) were willing to help. However, after much confusion upon the GA side, clans pulled out, eventually leaving just Damage Inc and Corruption left. After the consideration of fighting 5 on 2 just for our cause, Corruption and Damage Inc decided that it wasn’t worth it, thus canceling the possibility of a war involving at least 900 definite members between the combined clans. However, during this time many flame wars were waged on the Tip It forums. Soon after this, the Golden Alliance faded once again. Lk had died once again, and Supa Vegeta of Exercitum became inactive from Rs after joining Di. In late August, Corruption met EoH (after Rsd disbanded, most Rsd came here so they were #2) on a pk trip and defeated them in the run-in. EoH (Empire of Honor) members were furious as there excuse for losing was because their warlord wasn’t there. Therefore EoH leader Tammy declared war on Corruption. Many Corruption members feared they would lose because of EOH’s power. 90 Corruption members had signed up for the war as Zeus311 put the decision on the five high council. Of the five HC, the vote whether to war EoH or not was 3-2, therefore making the nulling the war. Member Xhitpointzx came back to Corruption after RSD closed due to Livinlarge21 quitting runescape because he felt Corruption was his home. Zeus311 eventually went inactive due to real life so B O O M was appointed in charge for that time period. On a pk trip led by B O O M, Corr ran into Devils. The Devils were defeated on this p2p pk trip which led to Bronxie, leader of Devils, to declare war on Corruption. Blaming the war declaration on B O O M. Zeus311 came back, but this war was somehow cancelled by Bronxie. After a few weeks in November, the members of Chopa234’s old clan and him were also sick of Zeus311 and Deathrune666’s leading. They quit Corruption and went to join The Devils Clan led by Bronxie (they were rank #5 at the time). Corruption suffered many pk trip crashing by The Devils because of spies working for Chopa234 on Corruption boards. Bountykilla1 also left to Devils and Pure_Ice89 left to EOH (she said she couldn’t take B O O M’s style of leading). Runewidow was promoted to high Council by Zeus311. Because Corruption was falling, Zeus311 decided to take the good members of Corruption and make a new clan. Eventually Pure Knights (Dave) came back to RS and removed Zeus311 and Deathrune666’s admin powers for a day. After giving it back, Pure Knights told the high council members (only B O O M, Elementofice, and Runewidow) of the revolution and that he was going to boot Zeus311 and Deathrune666. Zeus311 was booted the next day and Deathrune666 was changed to a normal member. The week later, Corruption called a meeting on a Monday and met in Varrock castle. Old school Corruption members P ko, Crazy foo997, Robtokill, and 1hellfire1 returned to Corr. After meeting in the castle, the twenty Corruption members went to f2p pk. Corruption switched servers a few times and eventually ran into 30 EOH members and were defeated. Corruption was outnumbered badly. A few days later, Deathrune666 left Corruption because he was mad at one of our pk trips being crashed by DI (made #1 after RSD fell). A Board Change – For Better? Or Worse? Pure Knights went inactive again. After a week of being inactive, Corruption members Crazy-foo997, Robtokill, P ko, and xhitpointzx invited runewidow to a convo on MSN to discuss the situation, where Elementofice and B O O M were not present. Runewidow kept exiting chatroom so the members started to flame her for lacking interest in important decisions. She got quite mad and left Corr with about 10 good members and created the clan LR (Loyal Raiders led by Runewidow and Deathrune666). As a result these two members were banned. -the previous regime run by newer Corruption members only worshipped strength, instead of old members. Many old and respected members were kicked during zeus’ time such as mortamus and so com. As a result a new clan, Loyal Raiders, was formed from the new Corruption members. Nearing December, the five, Crazy-foo997 (James), Robtokill, P ko, Xhitpointzx(Drew), and Elementofice (Jay) created new boards for Corruption and told all Corruption to register there. Low requirements were set for the time being. Within a day of each clan’s new beginning, a mini war erupted between the two. A civil war in fact; both clans had friends on the opposing side. In the end Corruption came victorious, but LR swore that this was not the last time they would meet. Due to an anonymous person ranking Corruption very low on Tip.it, Corruption declared war on about ten clans. However, none of the wars ended up happening, and instead, Corruption was to have a war with LC (Legendary Crew, a merge of The Crew- Rsd members, and Destiny of Legends) on P2P that very Saturday. Lc had 60 people show to Corruption’s 34, thus Corruption were slaughtered on war day. Crazy-foo997, thinking he had destroyed the clan Pure Knights had created, quit Corruption and joined Mk where he had a few friends. Pko, at the time, lost his passion for Rs and got his character banned and went inactive. Elementofice, who was feuding with the former Corruption members who joined The Devils, quit and joined Di. In early December Ar_Agorn posted that the Lords of Chaos (LoC), Corruption’s former ally led by Sally Sue and Lilchump5555 had started up again. Robtokill posted a request for alliance on their forums and it was approved. Sally Sue invited Corruption to come assist LoC in their war against the Rune Raiders, so Robtokill agreed and said that we would be at chaos dwarves until we were needed by LoC. After a few minutes Robtokill decided to move Corruption up to the gds where several of us were one hit as soon as we got their. LoC and Corruption contined to have about one trip a week until Sally Sue retired from Runescape and went to join DI. -Corruption suffered no losses, and actually walked out with more people due to a few late comers (35 walking in, 38 walking out). Deathrune accused Corruption of cheating, without any sort of evidence whatsoever. After being shot down by Corruption leader Robtokill, Deathrune asked that Corruption, “Just leave WW alone” (A few months later, WW disbanded). After the war Corruption banked and went out to Gds to kill crashers, but found themselves massacred by 60+ FoM, and various other clans. Nearing the end of February, DOA (led by robertwb) declared war on Corruption, but because of disagreement with Rob, the war was canceled. Robertw of DoA wanted a P2P war on 2-3 weeks notice, but Rob insisted on one weeks notice. The war with DOA was called off. Instead, we would have a war with RR on the same day. Still hungry for war, Corruption looked to an old enemy from Runescape Classic: The Rune Raiders. RR being a much larger clan that Corruption agreed to the terms proposed. Corruption was expecting around 60 people to the war, RR was unaware what they’d have. The day of the battle came, and Corruption leaders were puzzled as to how only 47 people showed up. Facing certain death, Corruption walked up to the Rogues Castle to face the 75 RR members. The tactic that worked in the war against WW was used again; the “Prayer Wall”. The battle didn’t last very long, and it was clear that RR was going to win. Outnumbered greatly, Corruption members still managed to take down around 25 members of RR. The Rune Raiders had gained their revenge for the events of the distant past, and a friendship was founded between RR and Corruption leadership. As the war came to an end, 30+ RR were left standing. The RR war was a big loss, as Corruption was now 1 for 3 in the 3 wars that took place in – LC war, WW war, RR war. As March was coming, Robtokill decided to have a war with ReBirth (Rb). Rb agreed. Thus the war day came, and 55 Corr showed up to fight against 50 Rb. Because we rushed in unexpected when Rb were still setting up, we caught them off guard and killed their leaders right off the bat. With the amazing organization Corr had and all the names being called, Corr destroyed Rb in an official war and left with no casualties. Rb gave us a clean war with barely any flaming and accepted defeat. At this point, RSC finally noticed that Corr deserved a rank in the top 20, but LK members like Zein33 disagreed. They ranked Corr at 20 or sometimes not even on the Top 20. Old school Corr members PingDing and Michaello rejoined Corr. At this time Seifer84 takes many members from his clan to join Corruption. As usual on their Saturday event, Corruption searched the wilderness for clans to fight. Luckily we found and engaged a clan called DeathRow (DR) and easily defeated them. After the PK trip DR regrouped all their members and managed to get 30 to show up. DR defended, while Corr charged. Elementofice, leading the charge and at the front of the charge, was dead in a matter of seconds. As Corruption charged in, the death march coming in from the East side of GDS was used; this proved successful. Corr fought back even with the person leading the charge, Elementofice, dead very quickly. As more and more DR members poured into Lumbridge, Dr claimed Corr cheated in the mini war by coming back to the fight. By the time the Corr in Lumby followed Elementofice back to Edge, word was that Corruption won the mini war. But Dr disagreed, they claimed they won by showing a pic of 2 noobs at GDS – so Elementofice asked Boygeniu for an official war to settle the score. Since both sides claimed they won, a war was the only way to go. A Few minutes later, boygeniu comes on Corruption boards and declares war on Corr. Rob accepted and the terms were an F2P war on 1 weeks notice. On war day, DR had 75 show up while Corr had 75 also so it was an even battle. As the war begun, things were confusing. Rob thought the war was to be east of GDs, but DR were dotted at the west of GDs. Thus about 20 Corr charged west to the DR death dot. Since DR only saw a few people come at them, they decided to ignore, but a few of them came out and attacked. While DR was all scattered, the rest of Corr marched in and the fighting began. Rob and Boygeniu were down in an instant. The war took up to 30 minutes, while Corr’s organization and levels overwhelmed DR. DR had constant members running from war and this cost them dearly. Once again, the Dr that had died and ended up in Lumby claimed Corruption cheated and started flaming. However, Boygeniu accepted defeat, but many DR members were still mad they lost. DR started to fall. About 10 of their good members left to join a stronger clan. DR changed boards, and Rob took advantage of this and got spies on the new DR boards. The purpose behind the spies was to see how easy getting a spy in was, but then Rob noticed all the flaming DR does on their private boards, so Rob declared another war on Dr to prove that Corruption was in fact the best. Many Dr Members saw this opportunity at revenge, but Boy was smart and decided to decline war because DR needed more time to regain its power. But Rob didn’t stop there. Rob used his spy and gained access to DR pk times on Dr boards. When DR pked on a Friday, they had 18 show up while 30 Corr were death dotted at GDS waiting for them. As they stormed in, the 18 DR were massacred. Some were killed, most ran. DR was furious on boards as to how Corr knew they were there. Former EoS member Tankhive2 began to make useless posts on RSC trying to start more drama between the clans. He claimed that it wasn’t an official DR pk trip. Corr accepted this fact and crashed DR’s next pk trip, the one on Saturday, one day after the first crash, and this was official. Most of their high lvls came and DR had 32 while Corruption dropped to 30 when the fight started. As DR rushed to GDS led by boygeniu as a mage, boy got 1 hit and the rest were all down in a matter of 10 minutes. Tankhive was spotted running down to chaos dwarves once 5+ Corruption piled him. DR morale was dropping dramatically. DR members were willing to do anything to get revenge at Corruption, but were powerless to do anything in their weakened state. Tankhive continued ranting on RSC making a post entitled “Is crashing pk trips noobish?” which caused another flame fest on RSC between DR and Corruption. At this point, Corruption’s presence was noticed and Corruption were ranked near 15 on RSC. It was now the end of April, and Corruption was back up to 143 registered members. Former DR member Grandslayer1 and former LK members Lancer3000 and Cloud Straif joined Corruption. A mini war between Corruption and EoS erupted, with the almost exact same reasons as the Dr mini war. Like the Dr mini war, both sides claimed they won, but unlike Dr, EoS wasn’t in the same league as Corruption, so they didn’t declare on us. The flaming between Corruption and EoS continue, as Tankhive becomes the leading factor behind this feud. An Alliance? Or Perhaps a War? Corruption and the Rune Raiders have been on good terms since after the war we had. Thus RR agreed to have an alliance with Corruption. Interestingly enough RR were also allied to DR and EOS (who were allied to each other as well) but assured their allies it would not affect their relationship. Dr and EoS members were uneasy about this and hoped it would end the feud between Corruption and Dr/EoS, but it wasn’t that easy. Corruption and RR started having allied pk trips. At the same time, Rebirth was closed by Rigmar Drake and Bobtheagent. Rebirth members were free to go anywhere, but most followed Rigmar and joined EoS. Now that EoS gained thirty plus members from Rebirth disbanding, EoS started to show signs of bravery , rumors of a declaration on Corruption were imminent. Rob decides to declare war on – THE’ clan, which is ranked number eight on most peoples’ lists. This war may, perhaps prove Corruption is worthy of a top ten spot. But Rob was too ahead of himself. On war day, 65 Corruption showed up to fight the 110 THE. Corruption was overwhelmed by THE’s levels and organization and thus lost the war. There was a miscalculation in the Australia/NZ times so around 10-20 Corruption showed up to the war an hour late thus missing the war however it was a defeat we accepted. Although Corruption had lost the war with THE, Corruption now knew what needed to be worked on. RR has been getting stronger than ever. The Jaguars clan has been going around looking for official wars. They were planning to war RR, but since they said they couldn’t trust RR, the war never happened. Instead, Jaguar leaders came on Corruption boards and declared war on us. Corruption would have one weeks notice to Jaguars’four weeks notice. On war day in late May, 73 Corruption showed to fight 80 Jagz. The fight took over 25 minutes, but after that the victor was clear. Corruption had won the fight with over 100 options left. Many Jags members claimed Corruption cheated after, but these claims all came with no proof. Lucca, Jags’ leader, finally accepted defeat and moved on. As the summer of 2005 grew close, the Titans clan came into power. On a pk trip Corruption had, Corruption ran into Titans pking at spider hill and had a strong victory over them. It was at that time that Corruption became interested in Titans. Titans was a clan that had a very fast rise in members and as such was more unstable than usual clans at the time. Many members kept flowing in to replace those leaving and so Corruption used this opportunity to send spies into the clan to intercept their PK trips. Titans suffered many pk trip crashes by Corruption in the early summer of 2005. On some of these trips, small amounts of RR tagged along, resulting in Titans claiming it was 2 clans vs. 1. The Titans clan founder, HarveyTian, even came onto Corruption’s boards trying to stop us from crashing any more Titan’s pk trips fearing the worst. However, Corruption did not hinder. Crashing continued. A week or two later in June, Corruption leaders decided to have a war with the BlackDragons (Bd) due to a few Bd members ranking Bd higher than CoR on Tip.it. But, on the war declaration post, Corruption member Volt Kreuger called Bd “Black Dicks” which seemed to have offended Bd very much as they declined the war with this being the reason. Instead, a four day planned P2P mini war against Mk was to happen that very Saturday. Mk has lost some power, so on war day, 60 Corruption members showed to fight 60 Mk at rogues. After about 15 minutes of fighting, Corruption remains victorious as 18 Corruption members survive and walk down to edge. At this time, Rigmar Drake and Bobtheagent decided to leave EoS and remake Rb, taking a good 25-30 members from EoS. Broken1, EoS leader, also decided to go on a two month vacation, putting EoS out of being able to official war for two months. After Mk suffered a loss to Corruption in the mini war, many questioned Mk’s power after losing so many members and now losing a mini war to Corruption. But Mk members didn’t just leave it at that. An official war with Mk was to be held in July. As war day approaches, after two weeks of preparation, Corruption pulls 90 members to war against Mk’s 73. The war lasted almost 20 minutes, with Corruption claiming the win with about 160 options left standing. However, on war day, DoA (Mk’s allies) were south at Chaos Dwarves supposedly ï¿½â‚¬Å“killing runners'”. After the war ended, the remaining Corruption forces head down to Chaos Dwarves and killed about five DoA before the rest ran south and down to edge. Corruption were now planning to crash DoA’s pk trips for interfering with their war with Mk. DoA pk trips were now being crashed by Corruption. On most of these crashes, DoA had less than or about 20 members, which resulted in an easy crash by Corruption almost every time. DoA members were now very frustrated with what Corruption was doing. MK accused CoR of cheating but were quickly shot down, even Di officer Bibbleboy posted saying he had watched the war and that Yamataka was just making stuff up because she couldn’t accept the defeat. One day DoA were crashed by Corruption in P2P which resulted in them asking for a mini war. Corruption agreed and headed up to GDs where nMe waited to crash the war. Robtokill tells Home Boy that the war has been crashed by nMe and that CoR are weakened by fighting off the nMe crashers. DoA still head up and attack the remaining CoR members, a memorable moment is Home Boy PKing Realo25 for a whip then immediately being ko’d for it by Robtokill and Seifer84. This mini war provoked CoR into strengthening their campaign against DoA. The Titans crashing continued, but this time, Titans decided to even the odds (or did they?). Titans started bringing their allies Dr on the pk trip to counter the Corruption crashes, and it succeeded. Due to bring two clans on one, Corruption suffered a few losses to Titans and Dr. Titans even once massed 360 options (120 options of Titans, rest of Dr and friends from other clans) just to kill a standard 120 option Corruption pk trip. Rr helped, but barely. At most, ten Rr members assisted Corruption against Titans and Dr, which didn’t help much, so Corruption and Rr were massacred by the full force of Titans and Dr. Around this time, Rr started to fall. They had lost one leader and went from 300 to 200 members in a week. Titans, seeing this as an easy win, declared war on Rr. Rr, in a very tight spot, still decided to accept the war. As war day came, 90 Rr fought the 120 or so Titans, and lost horribly. Corruption tried to defend Rr, but it was clear Titans had won the war. Crashing continued. More and more Corruption trips were now being crashed by the full forces of Titans and Dr. Repeatedly Corruption would mass 50 people to aid RR in their fights whilst RR would struggle to get more than 15 to help Corruption. Thus, since Rr as was not helping out at all, Corruption decided to drop the alliance with Rr. After the loss of the Anarchy war, Corruption leaders decided to sit back and just work on the members and organization instead of warring. During this month of solitary confinement, Corruption members worked on organization and trained, and after the month ended, Corruption is back with an 87hp/105Cb average and 165 active members. It was at this time that spies from Corruption found out about DoA’s plan and that they were plotting against Corruption. DoA leaders were planning to give their members 3 weeks notice then declare a two day planned mini war on Corruption. However, Corruption found out so were prepared. On September 17, a one day planned mini war against FoM (Followers of Malkav) was called. On war day, 70 Corruption showed to fight the 75 FoM. After 15 minutes of fighting, Corruption wins losing only ten people. 60 Corruption walked out alive. The mini war was fought well with respect, but that night, Corruption’s boards were hacked. The details involved a hacker (who is suspected to be SLayerOfTime, an ex-CoR who got kicked) getting a hold of xhitpointzx’s MsN account’s password, and thus found his forum password. Xhitpointzx account, being root admin, and, deleted the forums and changed all members to validating. Luckily, Rob was on at the time managed to get rid of the hacker before further damage. For the next few hours, the Corruption leaders and HC got all the forums and members back in order and fixed everything. DoA, seeing this as an opportunity to take a cheap shot towards Corruption changed their plan. Instead of the 3 day preparation they declared a 6 day prep P2P war.. Corruption accepted, even though suffering a board the night before. After the hype up to the war, Rob couldn’t handle keep his information to himself and decided to post all the evidence about the truth of DoA on RSC. The evidence was undeniable and this stunt ruined DoA’s publicity. Enough said, the war day approached. On September 24, 110 Corruption showed up to fight the 120-125 DoA at rogues. After 15 minutes of fighting, and supposedly nMe crashing, all DoA were dead, and Corruption walked out with around 200 options (100 options led by Afi_023, 82 led by ChazOvHul, and another 10 or so members scattered around wild killing nMe). DoA tried to claim Corruption cheated by bringing nMe, but even nMe admitted they were attacking both sides, and all the pics showing DoA AND Corruption dieing in nMe’s hands. nMe’s attempt at framing Corruption failed. Corruption had truly won the war regardless of whether or not nMe crashed. DoA started to respect Corruption now and to put the past behind them, but crashing would not cease. Corruption also vowed to crash nMe pk trips. A small amount of corruption, Led by XhitpointzX began to destroy everything SCUM did. One particular tactic created was to set up fake DM’s and wait for SCUM pjers to attempt to kill the Dmers then rush in, kill the PJers and vid the entire thing for evidence. Corruption regularily crashed lure trips and generally hunted for SCUM on p2p trips. This lasted for around a month before the clan fell into hibernation and eventually they disbanded. After a couple of months Corruption were, as usual, looking for a fight, Anarchy popped into there sights once again, This time it was to be a p2p 1 day prep miniwar, Corruption gathered there forces and started with around 200 Opts on the day, Anarchy started with 280 opts, However they were ill prepared and badly experienced in p2p wars, Corruption destroyed Anarchy’s force with ease, winning with well over 150 opts, The main reason it was so easy to beat anarchy was due to the lack of equipment anarchy brought and the poor organisation, a HUGE amount of Anarchy were ranging withlow range levels and in very poor gear, while 90% of Corruption was melee’ing with proper gear, whips, etc and the other 10% that WERE ranging had the appropriate gear and levels to handle it. Corruption found many more short prep wars, including two against Followers of Malkav, The first was to be a 1 day preparation Miniwar on f2p, FoM were ill experienced in f2p and although they started with around 10 more people then corruption (240 opts to 210), Corruption won with minimal casualties (less then 10 Corruption died). A few weeks later FoM decided that they could take Corruption in p2p, the place they had the most experience, Once again the numbers were in FoM’s favor but once again Corruption proved victorious, losing approximately 20 people in the war. An attempt at the top. Corruption hadn’t had a war in a while and were desperate for some action. (a while being a month or so) After asking around they eventually had to aim for some of the top clans for anyone to take them on, So they struck a war agreement with Gladz, It was to be Corruption + Jrs vs Gladz (Corruption Jrs had JUST started and consisted of around 15 – 20 lvl 90 – 95’s), The war was 4 days prep and come the war Day, Gladz had Maxed options, Corruption pulled approx 330 Options with there Jrs, Corruption fought hard but suffered a defeat. Corruption Leaders got word of an unknown country clan that had just taken down Anarchy in a full out War, Corruption wanting a battle decided they’d be a good choice, Once discussing with LF leaders war agreements were worked out, a 4 day prep with them, Corruption vs LF, Standard f2p rules. On the war Day Corruption pulled an impressive 340 options (considering the prep, that was around 70% of the clan) and were confident of a win, However as it came time to battle corruption got word of the enemies numbers, An astounding 150 people in just 4 days of preperation, Corruption of course lost the battle to LF, LF winnign with around 150 Options, There numbers simply taking the battle. Silent Assasins, a once powerful clan had been reborn, they were now around equal, if not better to Corruption’s stats on paper, Corruption leaders felt they’d be a good challenge and so they setup a short prep miniwar of 3 days, It was a weekday fight and so the turnouts were expected to be less then impressive, Come war day Corruption had 280~ Options while SA only managed to pull a little over 200, Corruption outright won the battle without any issues with a majority of there force in tact at the end. SA felt that this war was not fair, as it was on a week day, so the night the first war was finished a new war agreement was struck, there was to be a war that Saturday, just 2 days away between the two clans (2 wars in 1 week), Once again the war day approached and Corruption marched onto the battle field with around 300 Options, SA again only managed to pull a bit over 200 options and were slaughtered. Corruption had truly proven that they were the stronger clan. In a move of nostalgia, Robtokill decided that it would be a good move to ally with a clan named Divine Forces. Both clans had helped each other when in need and thus Corrupted Forces were born. CF had many dominating victories as CoR took DF under its wing. Many people commented on how alike the clans were. Sadly this alliance was not to last as DF made the decision to drop all its allies around 2 weeks later. 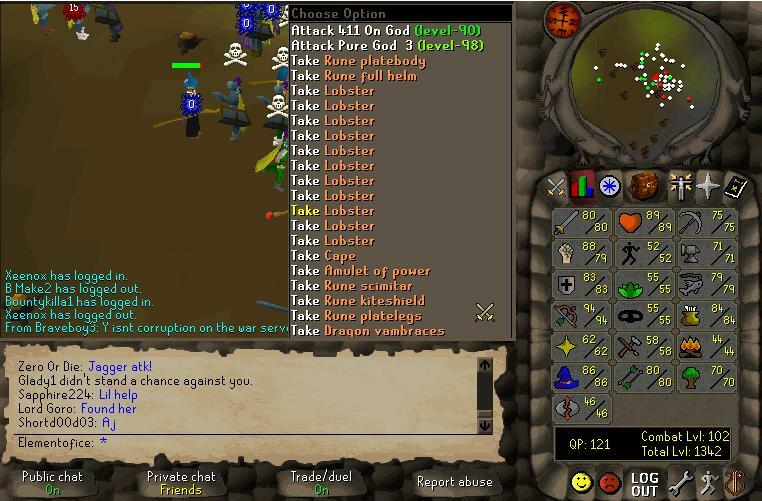 This greatly angered Corruption and as a result we turned on DF, crashing their PK trips causing a decline in the clan. After awhile, Robtokill , following a conversation with DF official S T O D, agreed to stop hunting DF and let their clan rebuild. It turned out to be the worst decision of Corruptions history. In a first in a LONG time for corruption, they had been outclassed in a War, The war being a few days prep against Runescape Dynasty, Corruption pulled 345 Options, RSD just 330 Options, Giving Corruption the numbers advantage, However RSD had EXCELLENT Organisation and an AMAZING level average of 120 Combat (corruption’s being just 112), The fight lasted well over a hour, the tides turning on who was winning all through the fight but in the end, RSD came out victorious with around 50 – 60 Options left. Corruption had been outclassed for the first time In almost 18 months. Since there miniwar win against Anarchy Corruption had aimed to get an official war win against there foes in order to even up the score and prove that we were truly the stronger clan now, However Anarchy had declined due to various reasons in the past, Alas after many months Anarchy made a comeback, They’d gotten to 210~ members with around a 113 Combat average, Corruption had just 165 Members and a 114 Combat average but that wasn’t to stop them, Figuring that while Anarchy had the paper statistics on Corruption they’d likely accept, Corruption once again declared and SUCCESS, Anarchy accepted. The war was to be a 1 week preperation war, with a VERY long rules list, This was the most closely watched War corruption had ever had, Nothing was to go un-noticed, The rules included 3 neutral vidders for each side to vid from the gather time to the end of the war, a HUG list of rules and a main rule of “If any member breaks a rule, they are to be booted from there clan, If the amoutn of rule breakers is qual to 50% or more of your ending opts, then you lose by default. The war day came and Corruption had mustered 360~ Options, falling short of what they had hoped for. Anarchy managed to muster maxed options, leaving them with the numbers advantage by 15 or so people, However that wouldn’t stop Corruption, Corruption marched to the battlefield, setting up there defence and awaited Anarchy to storm them and for the battle to begin, The battle lasted around 20 – 30 Minutes, Both sides fought well but Corruption was just too Organised and experienced in the end, They finished with an amazing opt count of 160~ Opts, Not far off half there force when they had started outnumbered. Further-more Corruption had NO cheaters at all, Not a single corruption broke any of the stated war rules. Corruption had proven once and for all that they were the better clan. In late December 2005/Early January 2006 Robtokill decided to remake Corruptions former Jr clan, The Corrupted, using it’s 15 jr members (a sort of original FA so to speak). Assigned to lead it was Volt Kreuger and Seifer84. Volt Kreuger set about making The Corrupted forums with the help of Mass Pudd, and Seifer made the arrangements for the transfer of JRs from the Corruptions boards to their own. Volt Kreuger and Seifer agreed on 90-104 combat requirements. The next day the transfer was made and Corrupted were their own clan. Volt and Seifer had a convo about what to do first, it was agreed that before we start to PK Corrupted would be drilled for a week. Seifer and Volt held a drill every day of the week so Corrupted would have some experience of our leadership. After the first week Corrupted had grown a bit in numbers and started to PK. Seifer worked hard on getting spies into smaller clans to bully so that Corrupted would have a successfull start in the wilderness. Volt Kreuger set about organizing some fun wars and PK trips. Then after about 8 months of Corrupted’s birth, Corrupted finally was disbanded. Seifer84 had to go inactive due to his cafe he owned. Seifers inactive caused Corrupted to get a new leader, Being ‘Hardyboys22’ and later ‘tfc lebanat0’ due to some problems with Hardyboys22 he was demoted later on, and in his demotion he caused alot of problems, and wasnt allowed back in Corrupted or have anything to do with it. After this happened Robtokill yanked every single Corruption member out of there, which assisted majorly in its disbandment. A couple months later Volt Kreuger had to go inactive for 2 solid weeks and during this inactive Tc disbanded, As Seifer84 and Leb wern’t active enough to keep it alive. Corrupted, like Corruption soon found it’s first rival, a clan called Demolition. DM had crashed Corruption in a mini war against ‘THE’ clan and been slaughtered, not keen to let it go Seifer decided to crash them and get some pay back. Unfortunately the crash didn’t last very long, because Corrupted members were calling with “corr” DM fled thinking it was Corruption attacking them, after that we agreed that we’d call with “TC”. After the crash DM’s warlord, Ripperoo and Leader, Saula13 invited Seifer in a convo. Saula began to flame Seifer and accusing him of being a bully. Then 5 minutes later asked for an alliance. Volt Kreuger was invite dinto the convo and not to long afterwords Seifer left stating that TC would be crahsing everything DM did until they died. Seifer went to work on getting a spy on DM’s boards, and did so an hour alter by breaking into the account of Wtxprog. Wtx had leaders boards access so TCs leaders had access to their rivals plans. Volt and Seifer spent the next few weeks crashing DM any time they tried to PK, Saula cancelled all PK for DM until further notice. The next day Saula wiped his boards clean and put a Corrupted banner at the top of DMs forums, then accused Seifer of their forums. Since Seifer had access to their admin CP it didn’t look good. Robotkill helped Ripperoo rebuild DMs boards and orders TC to lay off DM for a bit. Riperoo messages Seifer later on in the week and informs him that Saula is planning to put a spy into TC. Seifer logs check to see if the spy still works and it does, Saula planned to send a spy into TC and draw them out into the wild to be attacked by his entire alliance. Mass Pudd and Seifer decide to take the bait and go pking. 90 ops of TC stood at the GDs waiting for Saulas alliance. For whateever reason, one of the clans in his alliance attacked on it’s own, with no trouble TC dismantled it and moved down to the CHaos dwarfs to take on the rest. 90 ops to 170 TC walked out with not a single death. Saula gets desperate and asks for a mini war with TC. DM cheats and posts a video of themselfs cheating, later they go into a shut down and die off. Many of it’s members join Corruption and Corrupted. After an extensive period of rebuilding, DF once again begun to challenge Corruption during PK trips. To begin, CoR were every bit as strong as DF gaining numerous wins. However, in a bid to beat their former allies, DF continued to grow in numbers and experience quickly. This resulted in DF gaining wins over Corruption during PK trips. Corruption members argued that DF brought friends to their fights and used less than appropriate items (coining the term “dragon hide forces”). These claims led to heated arguments between both clans over RSC and as such created the beginning of the largest modern clan world rivalry. At this point in time Corruption had suffered a string of 2 consecutive losses to DF and as such suffered for it. The leaders decided to focus inwardly on activity and members instead of fighting DF. In addition the gear and people fighting for DF was considered questionable and many members did not agree to fighting a clan willing to go to that length to gain wins. DF claimed to have put Corruption in their slump, and there is an element of truth to this however overall DF played a very minimal part in this section of Corruptions history. For some time, Corruption had been in a huge slump. Some blame fell on the FA systems clans were now using to mass options on PK trips. Some on the fact that months of fighting clans such as DF + all their friends had taken it’s toll. TRWF, after months of mass recruiting finally decided to offer Corruption a war, in it’s most weakened state since the rebirth in 2004. Corruption, never backing down to a fight accepted the impossible war. The fight was over before it had begun, Corruption troops were killed by the overwhelming number of TRWF. After the TRWF war, Corruption searched for for another clan to fight, unexpectedly, Anarchy was to be that clan. Pure Knights and Chronic24 set up the war at Chaos Dwarfs on short preperation. On the day Corruption pulled 220 ops, Anarchy 240. The war lasted about 12 minutes, Corruption walked out with over 170 ops remaining. Corruption and Anarchy are to have another mini war. Corruption was slowly getting out of it’s slump. On the day Corruption and Anarchy meet with about 240ish ops either side. Once again Corruption walk out with a substantial surviving force. Chronic24 now refuses to ever fight Corruption. Bjcal26 is sent in to spy on Anarchy. Corruption also agreed amongst themselves that if they won with less than 50 options they would agree to null the war due to the heavy amount of crashers that there would be. Corruptions sign up goes extremely well, with 140+ members signed up in just over 12 hours, Di are rumored to have problems getting people signed up.As the week passed by Corruptions sign up list became bigger and bigger, Corruptions morale is at it’s highest. After a long and tense week the war day finally arrived. Whilst gathering for the war Ghjjf messages Seifer and informs him that TD have hacked Di’s forums. Seifer asks if he’s still ok to proceed with the war and is given the all clear. Ghjjf is also asked if he wants an anti crash team, but refuses the offer. Whilst setting up for the charge Ghjjf messages Seifer again and tells him that EoS have killed him whilst leading the Di force up. Seifer asks if the war is still ok to go ahead, Ghjjf says that he will head back up and the war will continue as planned. Finally after many disturbances Di finally get set up with 357 ops, Corruption have 399 with 150 people. Ghjjf gives the all clear to charge and so Corruption begins it’s deathmarch. The fighting is intesne to begin with, either side systematically knocking off the others leader figures. Ghjjf and Seifer set up anti crash groups between Di and CoR. As the war leans more and more to Corruptions side, Ghjjf begins to send Seifer messages about how the crashers were only targeting Di (even though RoT would later post pictures of them killing members such as Robtokill, Born Kill and many others). after 40 minutes of fighting Corruption ends with 120 ops, Ghjjf blocks Seifer on MSN. Corruption claim the win, however Ghjjf has told all Di that Seifer had agreed to null the war if it was crashed, then later denied that he had made the comment. Despite the controversy this war was a turning point for many reasons. Firstly it is to date the largest number Corruption has ever brought to any event. Secondly it was clear that Corruption were back, and stronger than ever. Under Chopa234 Corruption began to thrive. Chopa’s dedication to the clan was almost unrivaled. Due to his ability to be so active, Chopa was able to take charge in the leader role and maintain the active state of 190 members, the highest member count for any clan at the time. This led to Corruption excelling during PK trips, easily pulling 100 people to shorter trips. With the numbers advantage and increasing organisation under strong leadership, Corruption was able to set their sights on bitter rivals Divine Forces. The first encounter Corruption suffered a defeat, unable to return to fight as much as DF – with the fight lasting over 10 hours. However the turning point arose when a 6 day prep PK run in was organized. Corruption took the chance to hype the fight up, and take a resounding victory. Leaders at the time were Chopa234, Benfica slb and Ottawa. HC: Radicalsufu, Bishycool, Punkhazard. On a high note, Chopa234 steps down from Corruption leader leaving 2 in charge. In response Pure Knights returns to a leader/advisor position, and with Ottawa promotes Pearsaregood (former moderator) and Demonchild27 (oldschool rank) to High Council. In addition Legend 23 and Macca081 were also promoted to warlord alongside already flourishing warlord Andy4309. Member Abomnt was given HC but members were outraged as he had only been apart of the clan for 1 month. Abomnt did not want an angry member base and thus set himself down to warlord. However the damage had been done and despite his clear knowledge and intelligence, Abomnt took a clan friend rank and went inactive. At this time, DS the number 1 clan for over a year shocked the clan world, closing. After its reign of dominance, many members left RS completely, however a large portion left to join DF giving them a massive power boost and thus aiding DF in gaining hard fought victories over CoR. Following the intense battles between DF and CoR, Ottawa decided it was time he stepped down, to pursue extended RL studies. He had a choice of leaders – one being Radicalsurfu – a HC who had confidence in leading during PK trips and the other Demonchild27 – who had the ability to organize and inspire the clan both before and after hard battles. Ottawa along with Benfica slb and Pure Knights decided that the best choice was Demonchild27 and thus Demon was promoted to leader. It was later (months later) discovered that Radicalsurfu planned on quitting Corruption if he was not given leader at this point in time. However he stayed on , after speaking with Benfica. Be this as it may, a very big problem was created as Rad began to dislike Demon and was jealous that he was promoted to leader before him despite not being a HC for the same length of time. In the wilderness Corruption kept up the challenge of beating DF. At this point in time DF was considered number 1 with Corruption number 2. As the fights continued, many RSC users began to meld ranks 1 and 2 because the gap between DF and CoR was closing fast. Corruption maintained the pressure and begun to achieve strong victories over DF. 300 starting, 300 ending was a favorite phrase as Corruption would start and end the battles with 100 people (300 options). While wins were exchanged, eventually DF lacked the numbers to return in PK trips, with Corruption defeating them in less than 2 hours followed by less than 3 hours. It was this final win that not only marked Flintstoneman’s (arguably DF’s best warlord, respected by CoR) retirement from DF, but Corruptions accession to number 1. With Benfica slb commanding CoR in TS and Demonchild27 maintaining a standard of excellence, activity and dedication from the members Corruption were able to command supremacy at the top of the clan world. High Councils and Warlords, notably HC’s Andy4309 and Radicalsurfu, could not be faulted leading with confidence and ability in the heart of fire – taking Corruption into a new age and fulfilling a dream created nearly 5 years ago. Corruption was now the number 1 clan. As such we managed to build and maintain an active base of 200 members. Similar to DS (although DS was in a league of their own) clans refused to fight Corruption. CoR was forced to crash clans and fight 2v1 to get PK trips. Clans like DF, EH, VR, DI who were all considered in the top 5 would team to fight Corruption. Due to the lack of fair fights or challenging 1v1’s Corruptions numbers began to drop to levels around 160. At this point in time, sensing a chance to strike back DF once again began to try fighting Corruption. To begin CoR held them off with victories but DF managed to also gain wins. 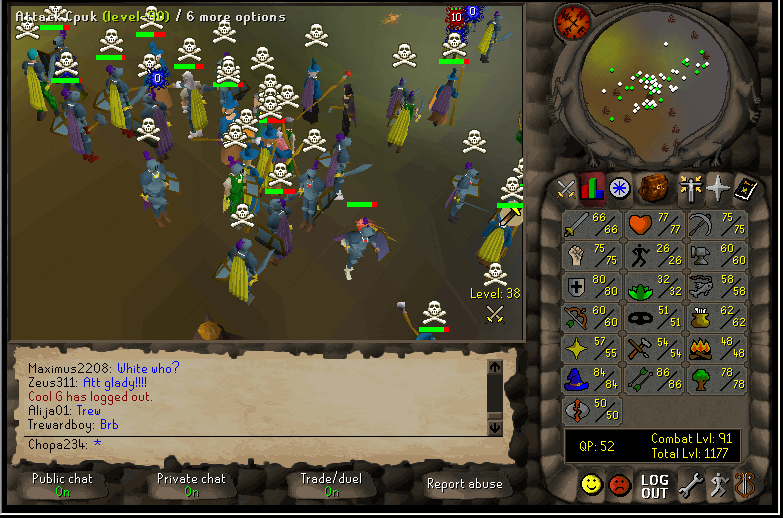 A great deal of controversy was created as anti crash teams (aimed to keep clans like RoT and NI out of the fights) began to get involved. EH and VR would kill Corruption members whilst EOS and DI would be called to eliminate EH/VR. Overall fights became a mess. As a result Corruption declared a 1 week prep PK run in event against DF. In addition CoR organized for DI to prepare to be on hand to kill the Acing clan who were expected to ruin the fight. DF in response had VR and EH gather and planned on bringing them to the fight. 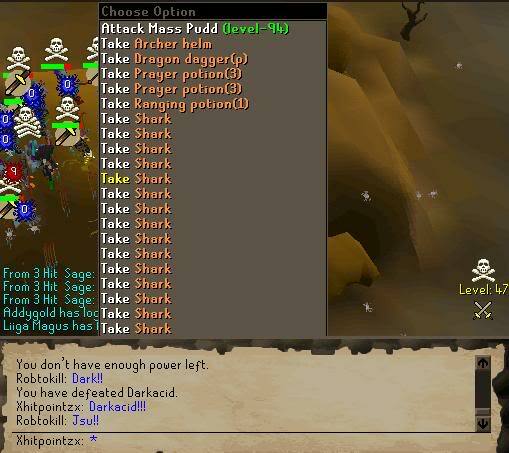 What resulted was the largest runescape clan fight to ever exist. There were two sides of the alliance. 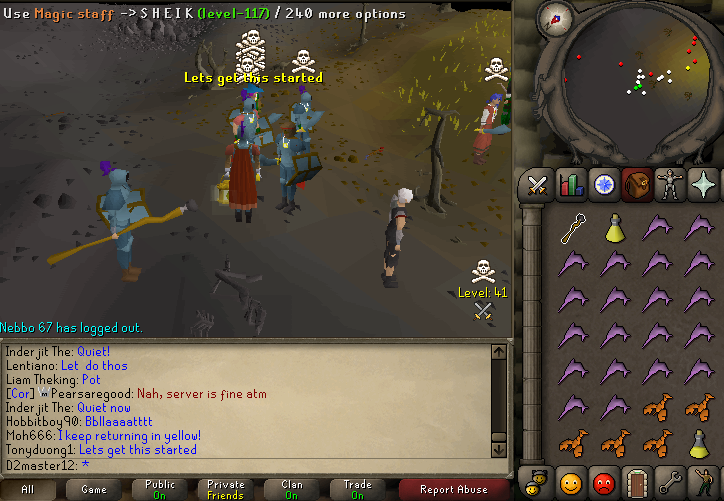 NH clans including RoT and NI sided WITH Corruption due to DF crashing and killing them regularly. They fought alongside CoR’s alliance but were not included with the team. The preparation was intense to say the lease. On the day Corruption pulled max options and a member count of 143 people. Coincidentally this was the last time any clan would ever pull max options in the wilderness. Quite an impressive achievement. ^Corruption, Titans and Collision (240 people) collectively following Demons distinctive bronze med. The fight itself was a mess. The charge was made by CoR, DI and CT. Demonchild27 led the clans in and was 1 hit by range before any dots even appeared on the map. This led Ghjjf to take control and rush the DF alliance who outnumbered CDTC due to the extra clan. To begin, CoR’s alliance with Corruption at the helm took control of the fight, driving DVECS to regroup more than once. However as the fight went longer, CL (being an Australian clan) gained numbers whilst DI started to log off. This left CoR’s alliance severely outnumbered. After an extremely long battle Corruption’s team was left defeated, with only CoR, TT and Col left returning. Whilst being defeated, Corruption were proud to have been apart of the biggest fight in RS and been the strongest clan out of all performing. Despite the loss bonds were formed between all clans involved, leading to many more alliance fights in the future. Corruptions alliance winning almost all of the due to superior clans (CoR, EoS, Col, TT, DI against DF, VR, EH, CL, SE). At this time Andy4309 was promoted to leader. Andy has and always will be the most talented wilderness leader Corruption has. His command took Corruption further than they ever have been in terms of organisation. The respect he had from every member was clear and his insight into tactics as well as empathy for others made him the perfect choice to lead next to Demonchild and Benfica. 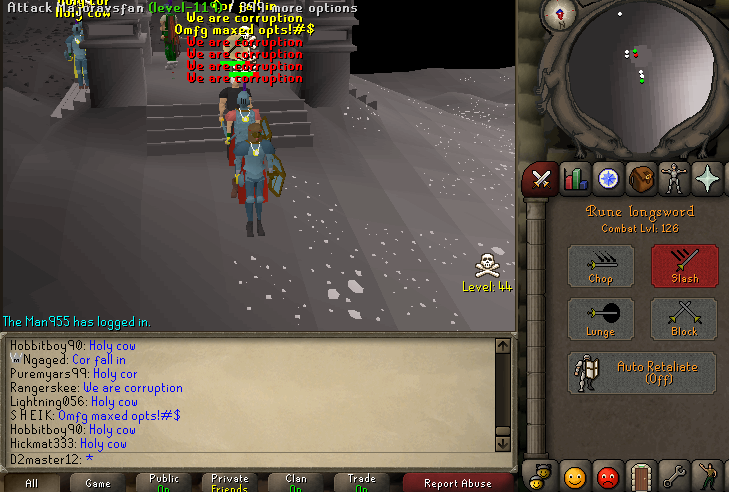 DF were the only clan strong enough to defeat Corruption 1v1, however never got the chance to fight. 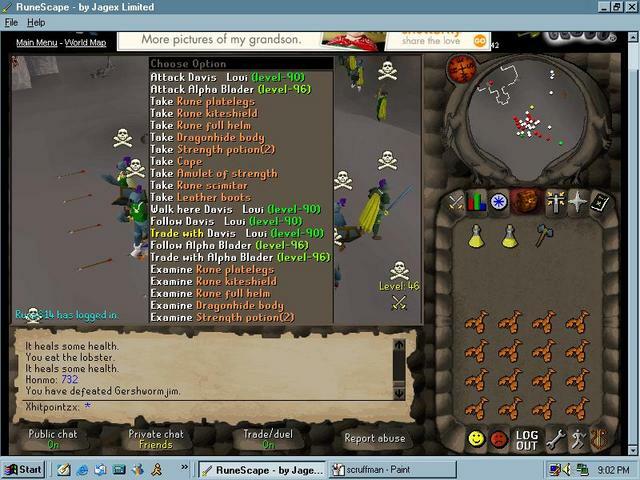 In a move that rocked the foundations of Runescape, Jagex removed the wilderness for good – forcing clans to migrate to either clan wars or bounty hunter. Mostly all clans moved to BH as returning was allowed – but this move caused almost death for Corruption due to the enormous issues that went along with the move. When Jagex eliminated multi and created the BH many members of CoR, dismayed went inactive or left RS completely. These were people who had stuck by the clan for years and each was sorely missed. Dispite this the clan looked promising to begin with. However, with the need for new officials to compensate for inactivity, it was up to Andy, Demonchild and Benfica to promote them. The hardest decision was the new high council, with the leaders torn between Roguejedi88 and Radclsurfer (the brother of Radicalsurfu). In the end, Demonchild moved for RJ and was backed by both leaders. However Radical was so infuriated by what he called a bias decision that he threatened to quit. The leaders were quite surprised at Rads streak of jealousy, and in a move to quell emotions and retain both Rad bros, promoted Radcl as well , in effect giving into blackmail. In a time with the pressure of having to adapt to the new wilderness after being one of the oldest clans in RS â€“ cracks began to form, particularly in the leadership group. The events which took place during this time were possibly the closest the clan has ever come to death. Radicalsurfu, who had been overlooked as leader finally began to publicly show his dislike and jealousy at being left behind at HC while Demonchild was promoted above him. This was primarily done by talking behind Demonâ€™s back , rumors which members took to heart and thus this jealousy and dislike was transferred to members â€“ while Demon still lead oblivious. Rad argued that Demon was bias, singling him out say he had chosen to promote RJ over his brother on purpose. Also claiming he favored members over himself as a HC. These were easily disproved and Rad was silenced but the feelings of resentment remained. Eventually this treason was brought to Demons attention and to solve the problem he called a leader meeting via teamspeak. At this meeting he offered anyone the opportunity to air problems they have with the leadership group, an indirect way of letting Rad speak. However Rad kept quiet so with co-leader Andy, Demon brought Rad into a private conversation and speaking directly to him asked to sort out the bad blood immediately, with a goal to move the ordeal behind them. Rad pretended to be AFK and frustrated Demon quit TS. Following this Radical ) and his brother Radcl stepped down from their HC positions. They did not tell the members why, instead when asked they continued to lie about Demon claiming he was killing the clan. Sick of the lack of faith or trust, Demon prepared to leave the clan â€“ however at the 11th hour Pure Knights and Tfc Lebanat0 returned to take action. TFC with backing from Dave kicked both Rads from the clan and after lengthy discussions convinced Demonchild to stay on. Andy4309 also almost quit the clan. The shock hurt the clan immensely with members leaving, others questioning the truth and this was reflected in the wilderness. Due to the Rad bros selfish and jealous actions the clan was at the lowest point in 5 years forced to rebuild once more. Whatâ€™s more it was left to Demonchild to clear his name and show the members who the true leader of the clan. It was a task he was up to and soon enough gained support. Demon used this to bring the clan closer together as a community, urging everyone to band together in the hard time to stay strong. The strong Corruption spirit did not fail the clan and it never has nor ever will. CoR struggled to keep up with 10 hour fights and pulling good numbers. Despite controlling fights on even numbers, clans knew they could simply keep returning to earn wins and this was what happened almost the entire time BH was used for PKâ€™s. The next step in Jagexs plan saw BH wilderness also eliminated and Clan wars became the new focus of clan fights. This suited Corruption perfectly, as while the dominated even fights, they constantly had difficulty returning for 10 hours. Now all that was needed was around 1 hours time to attend wars. CoR started off very successfully with wins over clans such as DI and EOS with around 70 people to each fight. After such success, clans started paying a lot more attention to Corruption , therefore CoR turned their sights on DF once more, challenging them to a weekday fight with 2 days preparation. In this fight CoR brought 73 people, outnumbering DF who had around 65 â€“ although having a much larger member base and holding strong in the BH wilderness. Corruption won this fight and DF members later were quoted saying that being outnumbered by CoR was an â€œembarrassmentâ€. This war was followed by another on the weekend as DF sought to redeem their loss. Two wars were held, a full out and a matched. DF had far superior numbers and so pulled 100 people, CoR on the other hand had a successful turnout for their member count of ~85 people. The full out was won by DF however the matched was the true story, as CoR had always claimed on even numbers they could match every strength DF had. This was proven as DF was defeated once again on even numbers. After a truly low point, Andy and Demonchild alongside oldschool officials such as xhitpointzx, tfc lebanat0, robtokill, rj had turned the clan around. Matched wars during the weekday became very popular. Corruption dominated these and began to form strong bonds with old school clans such as RSD and Titans. Using each other as practice CoR began to develop heightened PKing skills allowing winning streaks of over 10 in a row to build up. This was culminated with the clan wars tournament where Corruption was placed in the top bracket. CoR finished second only suffering 3 defeats. The last two wars Corruption had were won outnumbered. Cor defeated VR whilst being outnumbered by 13 people and Titans whilst being outnumbered by 10 people. Two victories nobody thought would ever happen. From humble beginnings we have built up to an incredible power. It has been a colorful history and one that will continue, our legacy will always have a part in Runescape forever and for years to come. We fight together every day, we enjoy Runescape for what it is. We are proud to represent the clan we love, we do the clan name justice every time we step into a fight. Corruption is an underdog clan. Anytime the odds are stacked against us we instantly have a better chance at winning. We never give up, no matter what and thatâ€™s why we are the oldest and most active clan that is still around and always will be. Our members have some of the best spirit in the game. We have been through mass leaves, officials leaving, changes rocking the foundations of the clan we love. We have been told we are dead or dying too many times. More times than anyone knows, yet here we stand, still ranked within the top 2 after 5 years. Corruption has been within the top 5 for the past 3 years. There is almost no clan that can ever touch what we will always have. This was so great to read.. I’ll never forget the good old days. If you’re reading this, shoot me an email to say what’s up. Much love! Started playing osrs again if anybody from back in the day wants to catch up. Rsn is born2slop. Wow. It’s been a LONG time since I thought about those days, thanks for the trip down memory lane. Forgot to add the part about lancer3000, hope everyone is doing alright. Can I get some credit for introducing Seifer84, Surfydude, Chris1800 and few others from Clan Nexus to Corruption? And duck Tankhive.